Pakistani al-Qaida Leader Qari Yasin Killed In U.S. Strike In Afghanistan : The Two-Way The Pentagon said that Qari Yasin was killed in a U.S. airstrike in Afghanistan. Yasin is linked to the 2008 bombing of a hotel in Islamabad and the 2009 attack on the Sri Lankan cricket team. 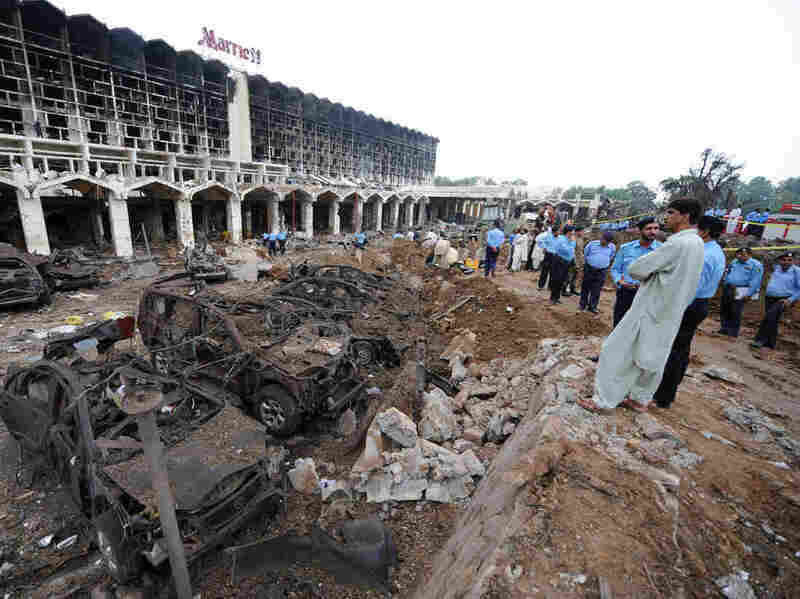 Pakistani security officials gather outside the devastated Marriott Hotel in Islamabad on Sept. 21, 2008, following an overnight suicide bomb attack. The Pentagon announced Satuday that a recent airstrike had killed Qari Yasin, who was linked to the bombing. The Pentagon announced Saturday that it had killed a Pakistani terrorist leader with ties to al-Qaida and the Pakistani Taliban. In a statement, the Pentagon said that Qari Yasin was killed in a U.S. airstrike on March 19 in Afghanistan's Paktika Province. It said he was a "senior terrorist figure" and that he had plotted the 2009 attack on the Sri Lankan cricket team in Lahore and the 2008 bombing of the Marriott hotel in Islamabad. Reuters reports that Yasin was killed in a drone strike. "There have been many suicide bombs in Pakistan in the last year and a half, but few more devastating than this. Hours after the blast, the Marriott Hotel continued to burn with such ferocity that it was in danger of collapse. Tired, dazed-looking rescue workers were still searching for trapped people and coming out with charred corpses. The Marriott is one of only two five-star hotels in Pakistan's capital. It's a favorite with Western journalists, diplomats and wealthy Pakistanis. It's usually well-guarded. The explosion happened just after Iftar, the evening meal when Muslims end the day of fasting during the holy month of Ramadan. Hotel owner Sadaruddin Hashwani says a truck laden with explosives pulled up at the security barrier at the front of the hotel." The 2008 attack killed two American service members, Air Force Maj. Rodolfo I. Rodriguez and Navy Cryptologic Technician 3rd Class Petty Officer Matthew J. O'Bryant. In the 2009 attack on the Sri Lankan cricket team, gunmen ambushed the team's bus, firing on it with grenades, assault rifles and missiles. That attack led to Pakistan's being excluded from hosting major international cricket matches, and the nation now plays most of its "home" games in the United Arab Emirates. Reuters reports that Pakistan's Counter-Terrorism Department had offered a 2 million rupee ($19,000) bounty for Yasin. "The death of Qari Yasin is evidence that terrorists who defame Islam and deliberately target innocent people will not escape justice," said Secretary of Defense Jim Mattis in the statement. "The Pakistani Taliban, formally known as Tehrik-e-Taliban Pakistan, are part of a loose and increasingly divided umbrella organization that once represented roughly 30 groups of militants. The organization was officially founded in 2007 by a prominent jihadist commander, Baitullah Mehsud, and for years it and allied groups like Al Qaeda have been based in the Pashtun tribal areas in northwestern Pakistan, particularly in North and South Waziristan. The movement shares a close relationship with the Haqqani network, the most hard-core affiliate of the Afghan Taliban, which have been behind repeated suicide attacks in and around Kabul and eastern Afghanistan. The groups also cooperate and provide haven for Qaeda operatives, including Al Qaeda's leader, Ayman al-Zawahri." The Pakistani Taliban were also responsible for shooting Malala Yousafzai, the Pakistani teenager who was attacked by Taliban militants for promoting education for girls. Yousafzai went on share the Nobel Peace Prize in 2014, becoming its youngest-ever recipient.